At any television station there are, basically, two broadcast management systems to be found - an automation system that monitors the scheduling of TV programs and CG (Computer Graphics) system that manages on-air broadcast graphics. Until quite recently, the automation system successfully coped with the monitoring of broadcast graphics, since it was fairly undemanding in terms of management (mostly confined just to one static picture in the background). Since then, broadcast graphics and visuals have become much more sophisticated. That is to say, the indispensable elements of today’s dynamic branding such as rapidly changing logos, messages from social networks, on-line voting must be instantly displayed. In a word, the growing complexity of real time data creation and visualization makes it a great deal harder for these two management systems to align with each other. Mozaiq serves as sort of a "bridge" between the two systems. This solution is designed to work with interactive data. It allows you to dynamically change something in one system or both responding to what is happening in real-time, be it telephone voting or schedule changes (both unexpected and planned). collect data from automation systems, video servers and other broadcasting equipment. accumulate data for reports in each workflow step and store it in the database. 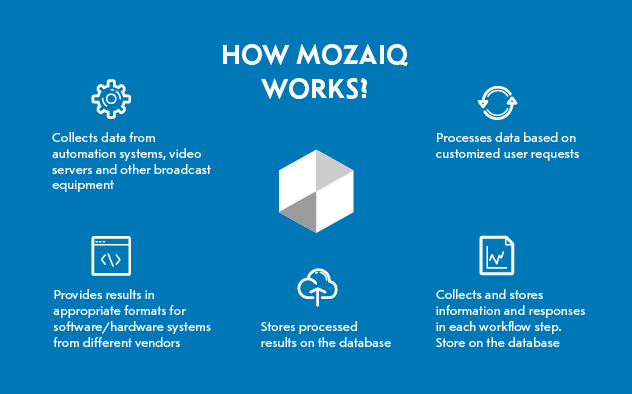 All Mozaiq components are accessible from a user-friendly GUI that makes it easy to configure each software module. The module can automatically choose a video for display from three alternatives depending on the result of the audience interactive voting via phone, SMS or the Internet. In other words, a clip with the highest number of votes will automatically be broadcast first. Years ago it was done manually, which could cause broadcasting faults. It is fairly hard to make changes within a few seconds, and a failure to do so may lead to inability to go on air in time and other hindrances. This module has been successfully implemented at PowerTurk (Turkey). The module can be easily configured – the only thing you have to do is to set three clips for each voting procedure. Mozaiq offers a quick way to create such a configuration through SlotEditor. The module allows you to generate thumbnails of video files in manual or automatic modes. The module can work with video files stored locally on the computer, on networked storage or on the video servers that provides access to the files via FTP. The module is used to automatically generate data on the next clip on the schedule of the automation system (the same goes for previews or ads on the current schedule). The Information on the selected clip is displayed with the help of CG system. It is a module which collects data from GSM 3G / 4G modems, reads and processes SMS texts, and writes the results in a file or database. What’s more, it can work together with the Voting module to collect data on the SMS voting process. The module selects playlists from templates with the necessary information (be it news, weather, warning messages) for on-air broadcast graphics system. The module is designed to check whether all current events in the automation system contain clips. It will scan all the locations (local and network drives of video servers running FTP / SMB) to ensure that the clips are there. This is an alternative solution for customers who do not have an IMM system.